Located on the Western Shore of Lake Michigan, Waukegan IL is a dynamic town with many attractions. Popular events include the ArtWaulk (pronounced Art-Walk), which happens every third Saturday of the month and features many paintings, sculptures, film, dance, theatre, comedy, and a variety of other performing arts all in the Arts District of Downtown Waukegan, the Chicago Latino Film festival, the Fiestas Patria Parade and Festival, and the HolidayWAUK, a holiday festival in Downtown. Waukegan is home to the recently renovated Genesee Theatre, a historic building completed in 1927 and now host to many different musical artists and shows. If thrill seeking is a passion of yours, be sure to check out the Six Flags amusement park, featuring many rides, attractions, and death-defying roller coasters. Waukegan is the birthplace of famous comedian Jack Benny and writer Ray Bradbury. Smack dab between Chicago and Milwaukee, Waukegan is a great place to live, visit, or have your corporate event, private party, or wedding. Howl2GO by Howl at the Moon is the premier name in Dueling Piano entertainment. Bring our incredible performance to your event in Waukegan at any venue. Bringing Howl2GO’s show to any venue in Waukegan means you’ll be getting only the country’s top Dueling Piano performers. 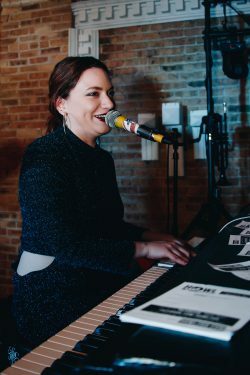 All our performers are young, exciting and high energy, as well as being experienced in playing all types of events anywhere in the Waukegan area. We specialize in all types of events, anywhere in the Waukegan area – company parties, wedding receptions, charity fundraisers or house parties are all made more fun by bringing Howl2GO by Howl at the Moon. We tailor every single show to you and your guests, playing music for all ages. Fundraising for churches, schools or your chosen cause is perfect for our show – plus advertising that you have Howl at the Moon performing is a huge draw in the Waukegan community. Howl2GO is the only dedicated Dueling Pianos company in Waukegan and our team works tirelessly to ensure your event is perfect. Our production team will deal directly with your Waukegan venue and, in conjunction with our Wedding Specialist, sales director and our amazing piano players, create a customized event just for you. Our Howl at the Moon musicians will take you guests’ requests live just as they do in one of our many nationwide venues. We are a perfect choice for your wedding – we keep numerous couples in Waukegan and their guests dancing all night, as well as taking care of all your ceremony, announcements and special family dance needs. Don’t risk booking a local fly-by-night company that may not even still be in business when your wedding date comes around, nor one that hires freelance players. Howl at the Moon has been rocking since 1990 and our reputation precedes us.